VULCAN — When he’s not on the campaign trail, hopeful State Senator Ed McBroom spends his time providing dairy products to the Midwest. It’s a tradition that’s been in the McBroom family for just over 100 years, when his great grandfather purchased the farm in 1917. After his death, the tradition stuck strong. That progressiveness has provided the farm with the most advanced technology. 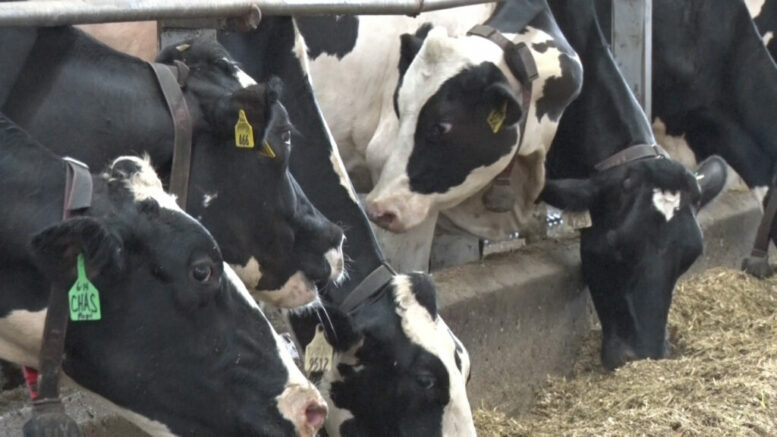 McBroom’s farm is one of two in the Upper Peninsula with the equipment to mass–produce milk. Before this incredible machine was brought to the farm, McBroom could produce about two gallons of milk every hour. Now, it takes less than five minutes to milk a hand–or udder–full of milk. And all a cow has to do is wait its turn, get into the milking corral and just hang out. “We make about 2,000 gallons of milk every two days,” McBroom said. From there, his milk is shipped to Lena, Wisconsin, where it is turned into mozzarella cheese in string form and for pizzas. One of the tough parts of the job is that Ed and his family don’t get paid for the milk they ship until about a month later. It’s a lot of work for very little reward. For McBroom, whether he’s on the campaign trail or monitoring his 300 cows, his work seems to overlap. And that’s just the way he likes it. And with about a dozen people to work with in the younger generation, the farm is bound to last another 100 years.